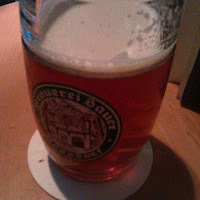 It was when we were in what was basically a style bar with loud techno music, yet were drinking a rather tasty copper-coloured Rossdorfer Braunbier on draught, that things finally seemed to come together and give me a sense of what Franconian beer is all about. If the waitress in a style bar has no idea which beer she's actually selling (she had to ask her manager which brewery it was from), yet is able to explain that in Franconia the local speciality is Braunbier and that most local breweries make one, that must mean something. Essentially, Braunbiers seem to represent a surviving 19th century bitter-ale brewing tradition, albeit now in bottom-fermenting lager form and often listed as Vollbier, which is a German taxation class - basically it's "standard beer". They range from pale brown or copper coloured to very dark brown, and while some resemble Munich Dunkels, others are much closer in style to English bitters. So how did 19th century bitter traditions come to survive here? For a start, Franconia is culturally rather different from Old Bavaria. It only became part of Bavaria in 1803, the dialect of German is different, and where in Old Bavaria you'll see everything decorated in blue and white, the Franconian colours of red and white are everywhere instead. Then from 1945, Franconia became geographically somewhat isolated by the Iron Curtain, as did neighbouring Oberpfalz, famed these days for its traditional Zoigl beers. They were in West Germany, but the Iron Curtain meant that they weren't really on the way anywhere any more - if indeed they ever had been. Things had already started to change though, perhaps showing the influence of Old Bavaria. 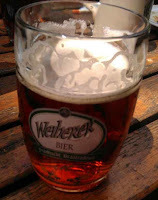 Along with Helles Lagerbiers, many breweries all produce a Weissbier as well, though pretty much every one I tried seemed rather dull and samey. And with Germany's economic growth and then the fall of the Iron Curtain, things have changed again. Despite their proud Braunbier traditions, many of the Bamberg-area breweries now list a Pils too, even though it is not a traditional style locally. It's an interesting coincidence that Pils manufacture has really only happened here in the last few decades, and appears to have picked up in recent years – Pils is known to many Germans as "TV beer", because it's TV ads from the big breweries that have established the myth that beer=Pils. Indeed, when we visited the Greifenklau brewery tap, we found Pils production had only started this year (though they were selling Göller Pilsner for a while before that).